It’s not every day that you get the first shipment of your new book. 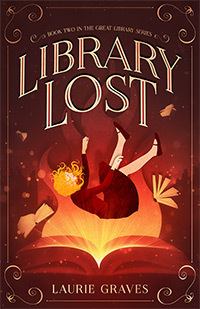 Therefore, when the box with copies of Library Lost came in, Clif and I decided to celebrate and go to the Red Barn for some of their delectable seafood and, of course, a whoopie pie. So good and so reasonably priced. 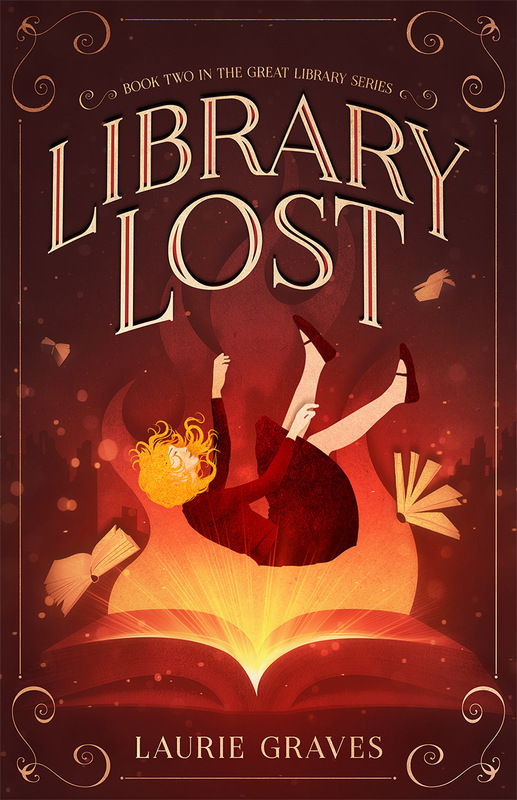 And speaking of Library Lost…my blogging friend Eliza asked how a copy might be ordered. Glad you asked, Eliza! For others who are wondering, all you have to do is click here, and it will take you to our Hinterlands Press website, where you can order a signed copy directly from us. The book can also be ordered through Amazon. On another subject…the holidays are coming—tomorrow is December 1—and yesterday I went into the woods to gather pine and dried fern stalks for outside arrangements on our little deck. I went midafternoon when this time of year the sun is setting and the woods are filled with shadows. 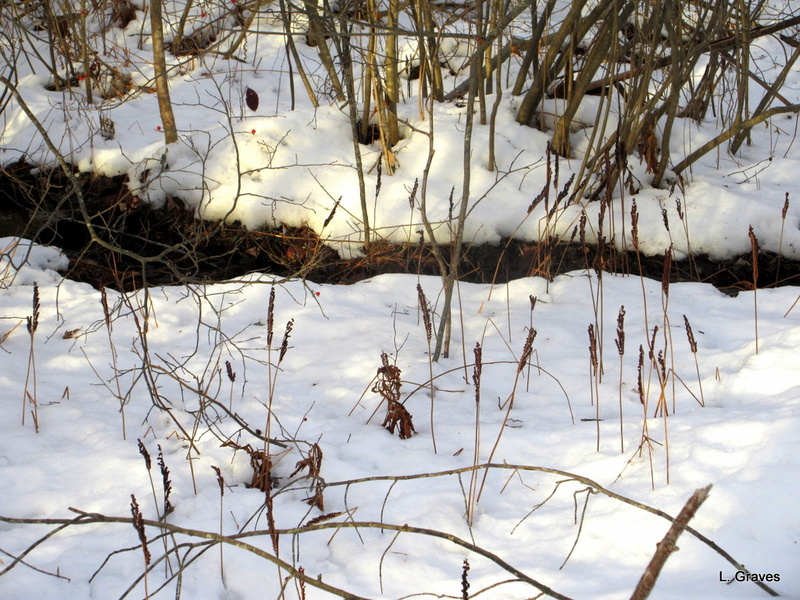 There were lots of fern stalks by the little stream that runs behind our house and eventually makes its way to the Upper Narrows Pond. 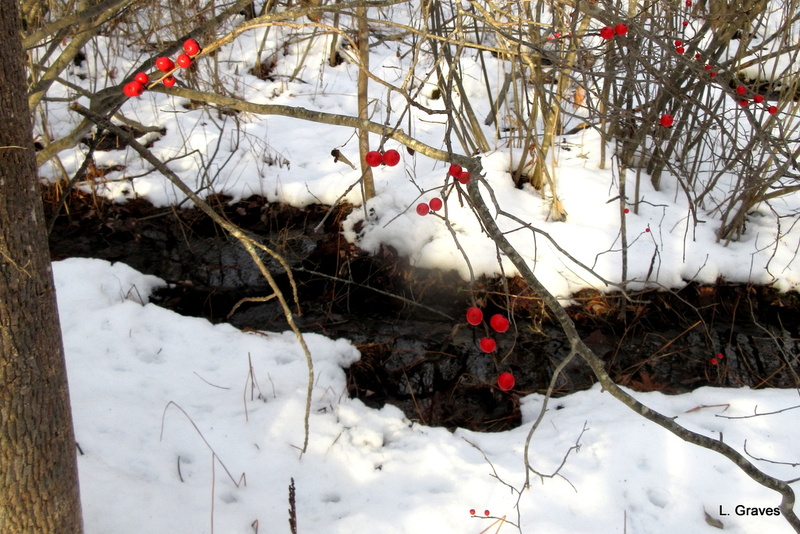 There were some winterberries left, a bright punctuation against the white of winter. Fortunately, I had gathered winterberries a couple of weeks ago, when they were more plentiful. And I came across this tree, covered with fungi. 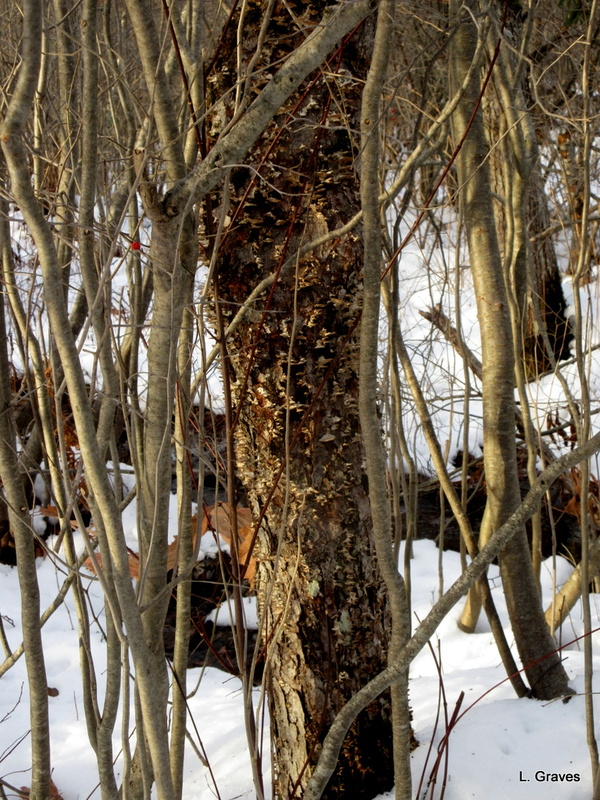 Always something to notice in the woods, even in the winter. My son and I actually made it to the Red Barn (finally) early last spring. It’s all it’s cracked up to be. Thanks for the reminder! Scrummy food at great prices. Not the healthiest, but good for the occasional treat. Congratulations on the book and Cheers! to Whoopie Pie! Many thanks! And whoopie pies are wicked good, as we would say in Maine. Thanks for the beautiful winter pictures. Good luck with the sales of your new book. The berries and fungus were good things to see on a wintry day. I would have been happy with just the Whoopie pie, looks so good! That whoopie was wicked good. And, yes, writers must work hard for every book they sell. 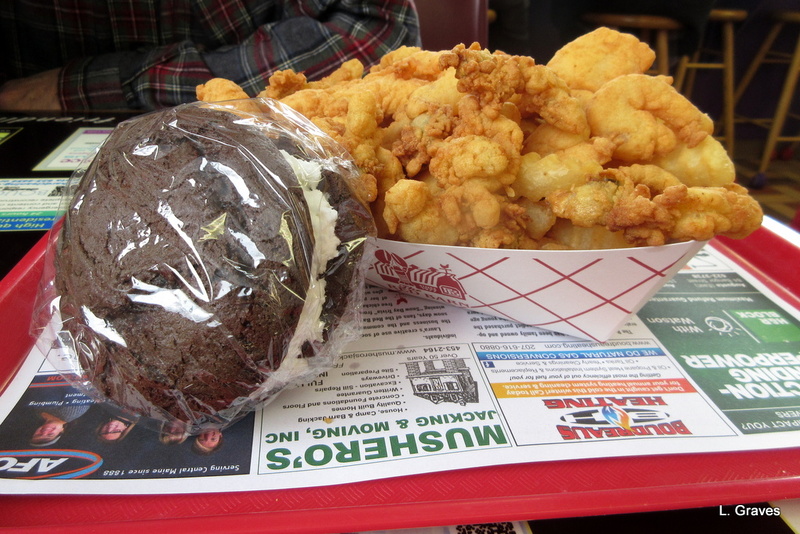 Did someone say seafood and whoopie pie? I haven’t had any seafood in a while, but I did have a delicious pumpkin whoopie pie with coffee and a friend yesterday. Delish! Another book – congratulations! Looks like you celebrated in style. Jodie, many, many thanks! Clif will be mailing your book today. And winter certainly came fast. Oh, yay! Looking forward to my new book! That looks like the perfect Maine-ish celebration! Glad you were able to catch some sunshine yesterday. The woods are lovely. And glad you took the time to celebrate such a wonderful accomplishment. That celebration meal was scrummy! Many, many thanks, Betsy! They will be heading your way soon! Good to celebrate with a meal out! So exciting to see your book. Great to celebrate!